Combined production from North Dakota and Texas made up nearly half of U.S. oil production according to the Energy Information Administration (EIA) in April of 2013. Recently, the state of North Dakota hit the 1-million b/d mark for oil, nearly tripling its production over a three year period. The increase in production is directly related to the development of the Bakken Shale. 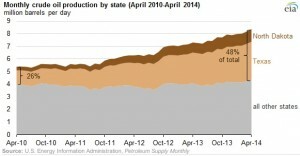 Since April of 2011, production from the Bakken increased 19,000 b/d on average each month, according to the EIA. In July of 2014, the EIA predicts the Bakken will produce nearly 1.1-million b/d of oil. June production was 1,074,000 b/d. The tight oil and shale gas revolution has changed the face of the energy industry in the U.S., and by 2015, the U.S. is predicted to be the top oil producer in the world, according to the International Energy Agency (IEA). As the country re-asserts itself as a world-wide oil producer, the state of North Dakota is expected to remain in a leading role for oil production. The Eagle Ford Shale in South Texas is the only other shale play in the country that can top the Bakken for oil production. State-wide production in Texas was 3-million b/d in April of 2014 according to the EIA. Current production estimates place Texas above the second rated OPEC producing country of Iraq.